by error, well I had to look into this. Roni was using an ALL PURPOSE cleaner with Orange oil in it and well since here in Canada some of our products vary I thought immediately of Orange Glo. So I head out to buy Orange Glo while doing groceries, brought it home, tried it and no it didn’t work. Well I should have read Roni’s instructions a bit better because she said it was an ALL PURPOSE Cleaner, what I got was Orange Glo for furniture, it is a little heavier and more oily than I wanted thus it produced no results. Good thing I have wood furniture so I can still use it but I was still not going to be beaten by this result. I was racking my brain thinking of what product could I get that had orange in it, well nothing other than Orange Glo but then I got to thinking and looking in my cleaning supplies and of course I had Pine Sol but with Lemon. I use it quite a bit now and love the lemon scent it has and just makes cleaning feel fresh but not overly sterile smelling. So I opted to try it and I can’t wait to show you how very easy and readily available it is. Pine Sol, I suggest Lemon Scent but if you have any other kind then try it first before running out to get the Lemon, the other Pine Sols MAY work but I am not going to tell you it does because I don’t have any other in the house. 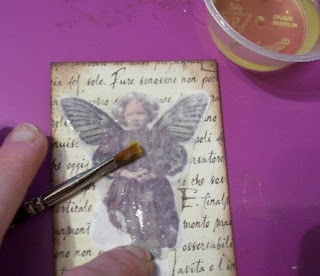 A paint brush the size for an image, even a cotton swap would be fine, images either colour or B&W INKJET, receiving paper, cut size of ATC’s, use book pages, whatever you like even the center of a paper doily would be nice for a card and a small container to put some Pine Sol in. Bone folder for burnishing is optional as well as the cotton swabs, scissors for trimming images. Dip your brush into your Pine Sol. Place your image face down on the receiving paper and brush the back of the image with the Pine Sol. You will start to see the image appear, keep brushing on Pine Sol til you have covered all of your image. Now either take a cotton swap or your finger, doesn’t matter and start to burnish the image, keep moving around the whole image. 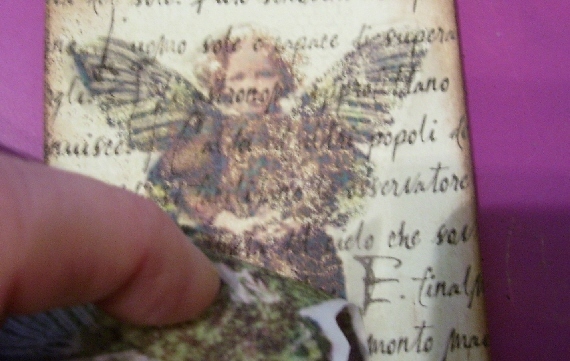 Hold part of the image and lift to see how it is looking, if you are happy remove the image and look at your receiving paper. 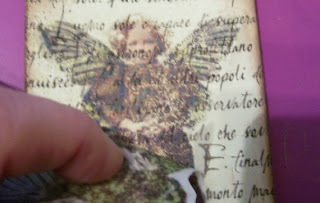 If you want to burnish it a bit more lay the paper back down and burnish a bit more even brush on a bit more Pine Sol. 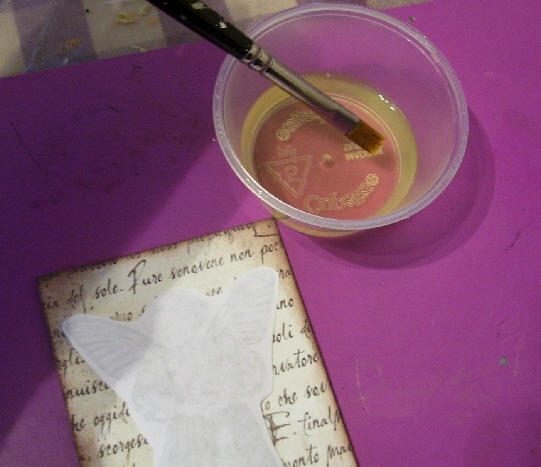 Also something I noted, the inkjet ink does not bleed like other techniques, it stays put while you are burnishing, unlike Gel Medium which I do like to use just made this observation. Now lift the image. You are done. I now use my heat gun and dry the paper. 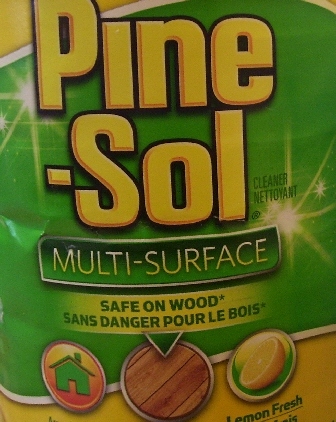 Nice thing about Pine Sol is it doesn’t leave an oily stain on your paper which is what I was worried about. Here are some other examples of the transfers here. 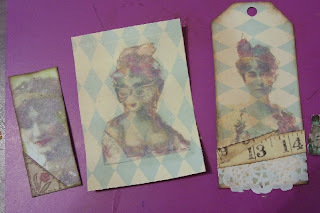 A tag, a Moo and an ATC. 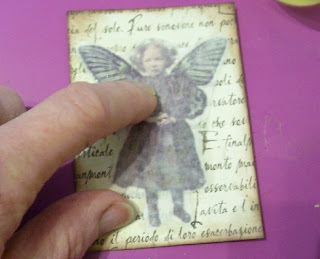 Here is the finished ATC with the girl with the butterfly wings. I added a bit more to it since this pic but not much and of course dried now after hitting it with the heat gun. Wasn’t that fun and so easy and something you may already have in the house. I also tried Isopropryl Alcohol and it works but I found it wasn’t quite co operative with the colours, it sort of changed them and the image was not as clear most ghostly. 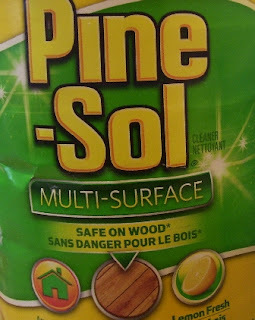 Thanks to Roni for her discovery for the Orange Cleaner and here is my discovery using Pine Sol. Hope you enjoyed this, I would love to hear your feedback and would love to see your results. This is very cool and I like the effect it had on your image. I will try this. I have had no luck with gel med and ink jet images. very cool Les.. will have to check this out..will have to see what I have.. love the way everything turned out .. Wonderful, Les! I can't wait to try this one. 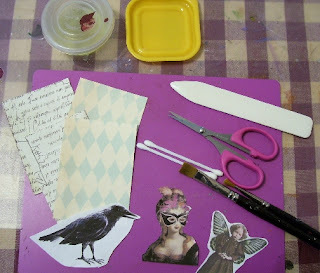 I have to try this- I love your projects! Thanks for the FYI. Pins sol, who would have ever thought!!! great discovery. I'll give it a try! Love transfer methods so thanks for sharing. When I've tried before it never worked and someone said it was because I use inkjet and would need a toner copier. So thanks for this. Consider trying newspaper or flyers with your Pinesol. I have used them with tranfer ink in the past which gave a similar effect! I've always used mediums and gone to the copy shop to get my images lasered so if I can get the same result direct from my printer with an inexpensive bottle of Pine Sol I'm one happy crafter! Well done on this tutorial - I'm certainly ready to try it! wow, awesome! that is something I will have to try! These look great. Thanks for the idea..must give it a try. I like easy. This is just awesome....thank you soooooooo much for sharing this with us. I am so going to try this out. Very cool! Thanks for the tutorial - I'll have to try it. I didn`t have any Pine Sol but I had a spray bottle of lemon Endust. I tried it for an experiment and it worked okay. I used black text because that was all I had printed out. I would suppose it would work okay on a printed photo as well. 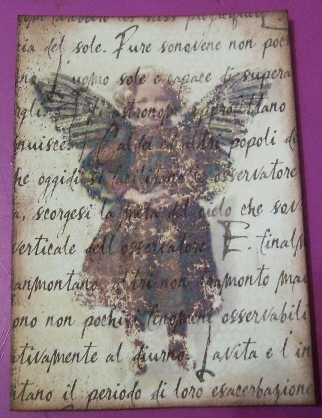 The paper dried clean and didn`t have an oily finish. Thanks for this great tutorial. I have wanted to do inkjet transfers for ages.